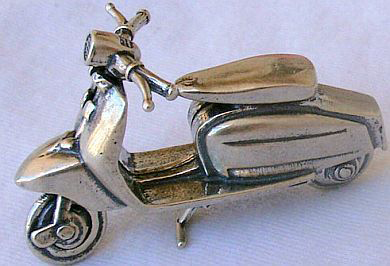 Listed as a “Vespa” this little scooter is made of .925 sterling silver and measures almost 2″ long and weighs almost 30 grams and costs $70. So possibly hefty enough to hold down your mechanic’s bills on you desk? Just sayin’ . . . This entry was posted in Decor, Models, Figurines and tagged lambretta, paperweight, scooter, sterling silver by Tracy. Bookmark the permalink.